The honor kicks off Moyer’s 150th years in business celebration with 150 Acts of Kindness. From the beginning, Moyer’s management and employees have been actively involved in the local community. In honor of this tradition, as we celebrate our 150th anniversary, we will be extending at least 150 ACTS OF KINDNESS to the community, by assisting service organizations, community groups, volunteer agencies, and individuals. We are thankful to the community for helping is successfully become the longest-lived family-owned business in the area, and we look forward to giving back as we celebrate our 150th Anniversary this year. 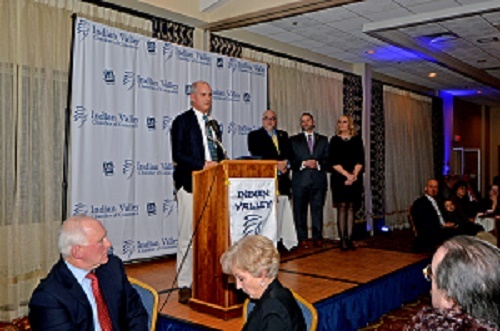 Executive Director, Indian Valley Chamber of Commerce, Steven R. Malagari, Representative of the 53rd District, and Susan Armitage, President of the Board, Indian Valley Chamber of Commerce.